Bill Gates is co-chair of the Bill & Melinda Gates Foundation. 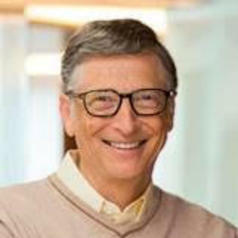 Along with co-chair Melinda Gates, Bill shapes and approves grantmaking strategies and advocates for the foundation’s issues. Bill and Melinda started their foundation in 2000 – the same year that the International AIDS Conference was first held in Durban. Accelerating the global decline of HIV/AIDS has been a priority for the Gates Foundation since its inception. The foundation is supporting numerous efforts – many of which are taking place here in South Africa – to develop new tools and strategies for prevention and treatment. He describes himself and Melinda as impatient optimists. They believe that by giving people tools to lead healthy, productive lives, whole communities can lift themselves out of poverty and achieve transformative change. He has received several honorary doctorates. This includes ones from Nyenrode Business Universiteit, Breukelen in The Netherlands, the KTH Royal Institute of Technology in Stockholm, Sweden, Waseda University in Tokyo, Japan, Tsinghua University in Beijing, China, Harvard University, the Karolinska Institutet, Stockholm and Cambridge University.